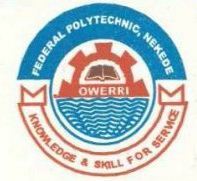 Federal Polytechnic, Nekede Owerri 41st Matriculation Ceremony Date, Venue and Time for Freshers/Newly Admitted Students Into ND1 and HND1, 2018/2019 Academic Session. The Rector of the Federal Polytechnic, Nekede Owerri cordially invites all Parents, Staff, Guardians and th entire Polytechnic Community to the Matriculation Ceremony of Freshers/Newly Admitted Students Into ND1 and HND1 2018/2019 Academic Session. The New Matriculation Ceremony Date is scheduled to hold on Wednesday 3rd of April, 2019. All Guest are expected to be seated before the Ceremony Commencement Date. More admitted names will be uploaded on Monday 1/4/2019 before the matriculation. Final admission list will be uploaded immediately after the matriculation ceremony.